ANY thoughts that World champion Mathieu van der Poel might race conservatively today - with one eye on Sunday's Superprestige - were quickly dispelled when he took the lead after 20 minutes of racing at Lilse Bergen near Lille. The young Dutchman was never headed again and won his first race resplendent in the new elite rainbow jersey convincingly. His lead over the rest – including local favourite Wout Van Aert who finished second – rose to almost a minute at one point. Van Aert had already secured the Trofee series title in the penultimate round but was racing for pride today and had to admit afterwards that "the strongest rider won." Van der Poel's rich vein of form – he is unbeaten in his five races during 2015 – augers well for his chances of increasing his one point lead over Kevin Pauwels in the penultimate round of the Superprestige in Hoogstraten on Sunday. The opening two laps of the nine-lap race saw David van der Poel, Lars van der Haar and Tim Merlier all lead but at the start of the third lap there was a big regrouping of ten riders at the head of the race. It was Sven Nys going to the front and upping the pace that made the first significant selection. Around the tight sandy corners on the lakeshore riders at the back of the group of ten, like Klaas Vantornout, where forced to queue up whilst at the front Nys sped out of each corner unhindered. Nys' pressure led to five riders going clear – Nys, Van Aert, Van der Haar, Van der Poel and Vincent Baestaens – with Kevin Pauwels chasing in sixth. Nys gestured to Van Aert to help him on the front, which he did, but at the end of the third lap a big group (of 12) had formed again. It was then that Van der Poel came to the front and things started to break up for real on the fourth lap – whether this was deliberately after Van Aert's pacesetting we're not certain, but the move certainly distanced the young Belgian. Van der Haar and Nys were the only two riders able to stay close to Van der Poel before Van Aert got around Nys and into third place, but he never got near the rear wheel of the Dutchman. At the end of the fourth lap Van der Haar made contact with Van der Poel, but with Van Aert and Nys not that far behind the younger Dutchman forced the pace again and broke clear - this time for good. Van Aert got up to Van der Haar and into second place but Van der Poel had established an 11 second lead by the halfway point of the race. It was a lead that he then continued to increase. Van Aert and Van der Haar's chase may no impact on Van der Poel's lead and the pair were caught by Nys and Pauwels - with three laps to go this quartet trailed the leader by 28 seconds. With two laps to go, Van der Poel took a look over his shoulder down the long finishing straight and saw no one – his lead was now 35 seconds. Despite making small mistakes the Dutchman was maintaining a steady pace of just under 25kph and on the penultimate lap his lead hit it's maximum of 50 seconds. On the final lap, Van Aert led the chasers again in attempt to salvage some pride over his home soil with Nys seemingly dangling off the back of the foursome. Nys was, of course, eying a podium spot though and dived in front of Van der Haar and Pauwels, forcing them to stutter on a rise, before it wound up on the approach to the finish straight. With Van der Poel safely across the line, Van Aert led out the four man sprint for second place which ended with all four almost abreast of one another in a photo finish. 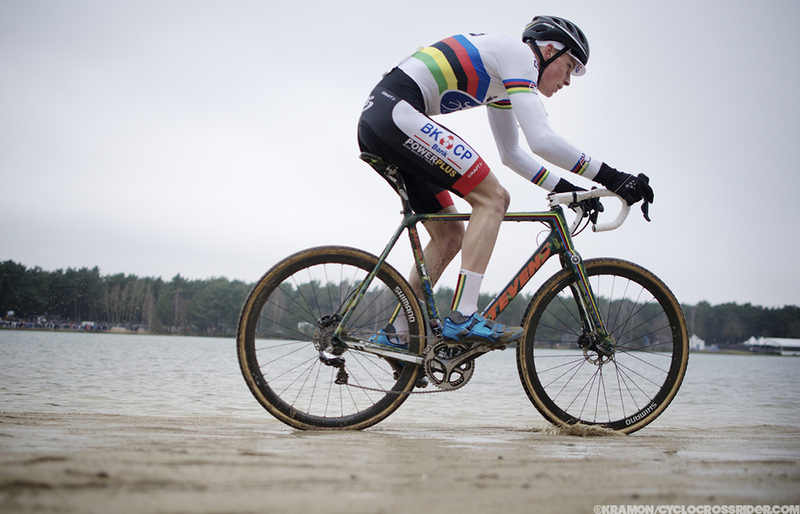 It was an easy photo to analyse and Van Aert and Nys were awarded second and third ahead of Van der Haar and Pauwels. Whilst Van Aert was the stronger of the young pair in November and December, Van der Poel has certainly showed in 2015 that he has hit peak form in the most critical part of the season. Belgian Ellen Van Loy won the elite women's overall Trofee series, but had to concede some of her winning margin to Belgian and European champion Sanne Cant today. Cant won solo in Lille but could only reduce Van Loy's near two-minute lead in the time-based series by around a minute. British champion Helen Wyman finished third today and stayed in fourth place on the overall standings.